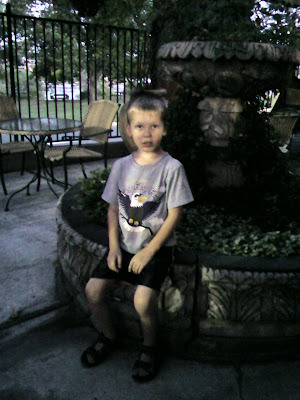 we drove over Highway 12 from Clarkston Washington to Missoula Montana and while we did get out and walk around the loop at Colgate Licks (a natural mineral deposit where the Elk and Deer gather) with the natural hot springs, Jordan had his first outdoor adventure in Idaho. the day was very sunny and the trip went very well. we met Uncle Patrick and took Auntie Jazz lunch with some extra "sauce" she WIGGED! Grandma Kat couldnt wait anymore, had to have the little gummy bears shipped up north. Grandma Joan took them to the airport in Houston, Texas, I picked them up in Lewiston, Idaho. 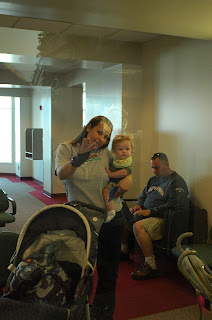 Jordan's very first plane ride on Delta Airlines. He did good on the first flight, but not so good on the last flight. Now he gets to meet his Auntie Jazz and Auntie Naomi. It was a surprise and boy was it! got in at 10 pm and so that we can drive to Missoula Montana bright and early on Sunday. 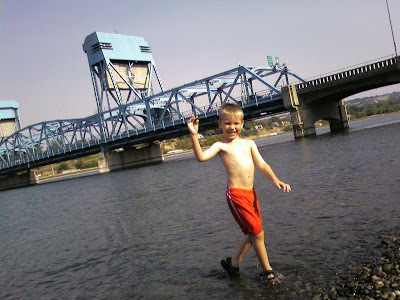 walked over the blue bridge from Washington to Idaho. explored the Chamber of Commerce of Lewiston. walked further down past the Train Terminal Station (now a law office) and the County Court House. Magnus whom is for the most part fairly calm, is now upset because there was nuts in his bread, is hogging every baby blanket in the room and crying that Naomi is making noise and will not let him go back to sleep. We got him a loaf of his 'nut free' bread to keep him happy. Naomi has gone from a tiny petite cute little insane creature to a monstrously large an emotionally volatile and violent little beasty. Never knowing when she will go from compliant and pleasant to thermal nuclear meltdown, today it was in the bread isle at Albertsons, screaming her bloody head off. An elderly couple were asking if she needed help, thinking that I was killing her or something. gracious. Erik flew from Houston to Bergen and only slept the last 15 minutes, had ADHD the first 23 hours of the flight. Poor Sverre. ;) They are going to tough it out for the day with no sleep so that they can adjust to the sleep schedule there, a 7 hour difference from home and 9 hour difference from here in Washington. 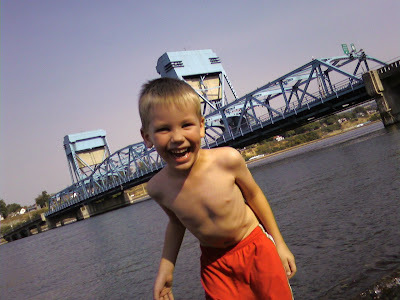 Indian Timothy Memorial Bridge is built in Asotin County in 1923. In 1923, the Indian Timothy Memorial Bridge is built in Asotin County on U.S. 12, spanning Alpowa Creek, not far from the Snake River. It is a concrete-arch bridge build in a "rainbow arch" design made popular in the 1910s and 1920s by James Marsh, an engineer from Des Moines, Iowa. The two-span, reinforced-concrete bridge was dedicated to Ta-Moot-Tsoo (Chief Timothy). Chief Timothy was a Nez Perce Indian who was friendly with early settlers and was credited with saving the lives of Colonel Edward J. Steptoe's troops in 1858 after their defeat in the Battle of Tohotonimme, near Rosalia. 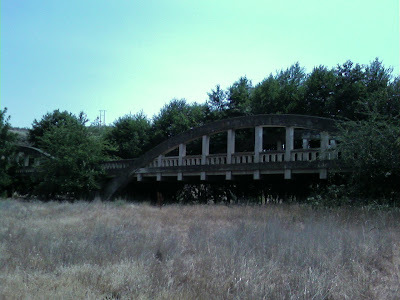 The bridge was erected by the Colonial Building Co. of Spokane on what was then known as the old Inland Empire Highway (later SR 12, later still, U.S. 12) that connected Clarkston with Walla Walla and the Tri-Cities. The bridge has 20-foot-high ribbed arches, and is known as a half-through structure because it is braced only below the deck and lacks overhead cross-bracing ties (a through structure is braced above and below traffic). Engineers gave the balustrade-style guardrail arched openings, and made the concrete arches smooth to mirror the area's high, rolling prairie hills. According to Craig Holstine and Richard Hobb in their Spanning Washington, these design effects may have had Chief Timothy's approval. In 1982, the bridge was listed on the National Register of Historic Places (Structure -- No. 82004194). It is no longer in use, but is a roadside attraction at a highway pullout. today we went on an adventure. first Naomi came for lunch and we packed our picnic lunch of pbj and crackers. 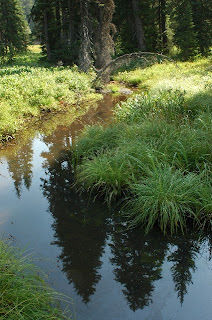 water with wyler's 'to go' and set off down the river towards the Chief Timothy Park. Stopping at the Clearwater Wildlife Nature Preserve West of Clarkston, Washington, we STUFFED ourselves with fresh ripe succulent blackberries. It is amazing how many more I can gorge myself on when I am on location, but how few I can get down when I am back home. regardless, Naomi Loves berries and she ate every single one that I put in her bucket. she really liked them. Magnus manned my bucket and he didn't have one. He saved them all for me. he is a really nice boy. Last night was downright scary. Did not get my fluids in, and the heat was not too bad, but over all, severe dehydration, combined with a small bowl of rice pudding, sent me into a toxic shock that was extremely bad. My heart was racing, my body was sweating, I had bad chills, and I passed out several times. Finally got 40 oz of fluids in, mom thought I was going to puke that all up. But by sipping away, I got it all down. Ate some nuts to get protein in my tummy to stabilize that. I took a shower to get my body temperature down and went to bed with my hair soaking wet and felt better. Magnus eye is all better, all on it's own. Erik / Sverre are preparing to leave for Norway on Friday, that will be a long 24 hour flight for them. Erik has developed a fondness for Miley Cyrus / Hannah Montana and so has her songs loaded on his MP3 player for the journey. Went consignment shopping yesterday and found a couple of bargains. ;-) always fun project. Still have not located the diaper covers that were my objective, but maybe next time. Drove around exploring and viewed the prairie fire damage up close in Asotin. Pretty scary to think of it coming so close to the homes there. Magnus and I are currently poolside waiting for a washing machine in the laundry, it is laundry day. Luck of the draw this morning, got really good coffee at the motel, the odds have not been favorable this trip. Better luck at McDonald's. Starbucks of course STILL can not brew a decent cup of coffee in Clarkston, not in the stand alone nor at the Albertsons locations. 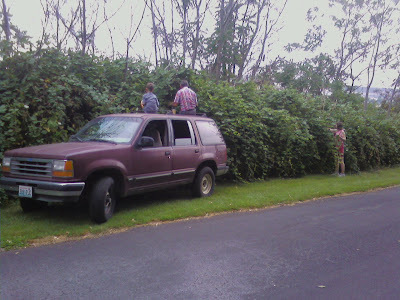 Oh how I love eating blackberries straight off the vine. YUMMY. found so many today that I ate until I thought my tummy was going to EXPLODE. then found an APRICOT tree. I wolfed down two and they were really good. fought off the sweat bees for them. 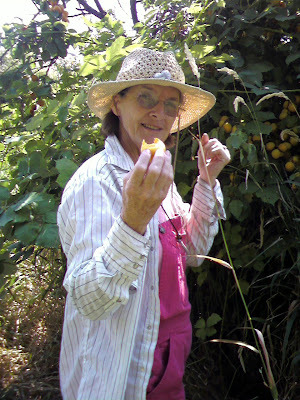 Granny Sherman also is demonstrating how sweet and ripe the apricots are! took about 20 minutes for them to ferment in my tummy and then I thought that I was going to really suffer for my over indulgence. but wow, they were so YUMMY! Asotin burned really bad and the smoke in the air gave me a really bad headache so I spent the day existing rather than accomplishing anything more productive than taking a nap. even a large mocha frap did not help me for more than 20 minutes. It got up to 103'F today. Morning trip to Lewiston to hit the bank, then Naomi was delivered early, for a nice if not quiet visit. Lunch was PBJ and cinnamon rolls. Naomi was frequently agitated because she constantly wanted to take things off the motel maid's carts. Finally got her to settle down and watch some afternoon PBS shows. A quick trip to the pool was a nice change of pace and helped to keep her cool. Magnus has the startings of a Hordeolum (stye) on his upper right eye lid, this is from the stress of being on vacation, he really doesn't transition well at all. Daily he requests that we go back home to Texas. we waited for Naomi, walked down to the Beach with a picnic lunch. PBJ's, Cinnamon Rolls, and Propel. Jazz arrived at 3 am and immediately crashed into bed with her dog atlas. 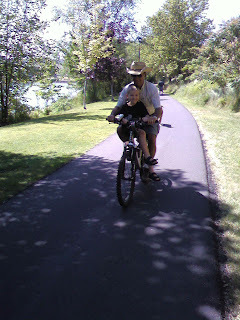 When we woke up, we went to the beach to meet the grandparents coming back from the morning bicycle ride to Asotin. At Noon, we had Naomi delivered and went for lunch at McDonalds with Missy / Logan / Zane. 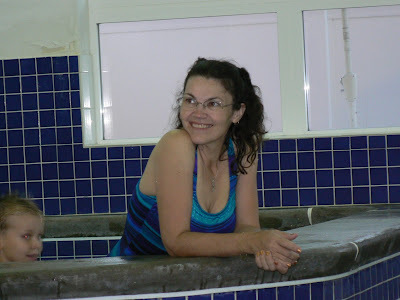 then swimming at the Indoor Pool. Very nice and upscale. running 107'F is just too freaking hot! uncivilized hot! have been holing up in the Motel 6 with the A/C on. Today was a break in the Heat Wave, and it has been a frigid 90'F. have had the window open but no A/C on. Naomi was here this morning, we went swimming, she was in and out of the pool and hot tub and bathroom just about equally. need to get her a velcro tie wrap from the dollar store to keep her swimming suit modest. I was so hot this morning, that I went into the pool at 10 am, and with wet clothes on, laying on the wet concrete by the pool, I got downright cold. that finally broke my 'sweat' and I have spent the next 5 hours warming back up. finally bringing my body temperature back up about 3 pm. Microwave/ DVD Player / dishes / dishdrainer / electric skillet / silverware / utensils / can opener/ fly swatter. ;) we went to Costco this morning and nibbled all the 'samples' and got our tummies semi full. Jazz should be here in the morning, and then I am sure she will sleep for the first 12 hours, but looking forward to her visit, have not seen her since January. French Toast/Ham, Tang and Mellon patriotic breakfast at the church... we had a pleasant time. Naomi was so friendly and Magnus had seconds. we went shopping and picked up some supplies and the essentials for our 'camping' event. Microwave, DVD player, counter top skillet, dishes, a couple of toys and storage totes. Evening event: Clarkston's Adams Field Community Spirit Fireworks Display & music.The festivities kicked off at Adams in the afternoon. Plenty of events were planned throughout the entire evening, including the Colgate Country Showdown and a performance by Coltrain. the treats for us were lemonade, hamburger, and chocolate ice cream. oh goodness. it was a long day but pleasant day, the band before the fireworks was so good. we loved them last year at the night out and this year was good as well. we were late getting out of Houston due to the Delta pilot being late out of Salt Lake City. 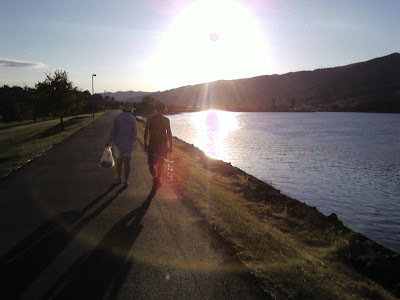 missed the connection to Lewiston, was afraid of that, leaving that late in the day, allows no margin for error. No flights into Lewiston on Tuesday, so they booked me into Boise, with a night at the Holiday Inn. The Messaging Shower head was VERY helpful this morning! Going to have to install one of those at Motel 6. Room Service at 6 am had fresh fruit and hot coffee. Horizon had free Starbucks coffee in the waiting area, that was SWEET, got a cupa java to wake me up. Then on Horizon into Lewiston, 12 hours late, but still in time for my visit with Naomi. Doug is with the TSA , moved my truck from the Gustin Aviation Parking Lot to the Staut Aviation lot, that was extremely nice. I am getting downright SPOILED! the Truck is running really well as well. may take it to Montana this week afterall! hanging out here Clarkston and enjoying spectacular weather. last year there was a pancake feed in the morning of the Fourth of July and then a concert and fireworks in the afternoon. I have not ventured forth to see if there is a repeat this year, but it would be nice if there was. We are entrenched at Motel 6 and settled in for the summer. There is a 37% chance of a Hot Day (temperature over 90°F / 32°C). There is a 20% chance of a Precipitation Day. There is a 5% chance of a Cloudy Day. There is a 4% chance of a Windy Day (average wind over 10 mph / 15km/h). 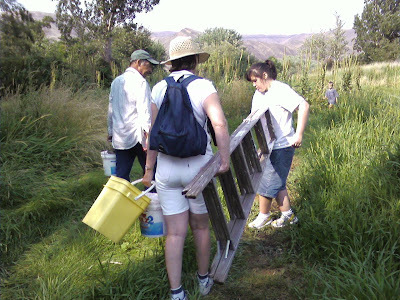 There is a 9% chance of a Humid Day (dew point over 65°F / 18°C).